Newlyweds Josiah and Lauren Duggar, who have been married almost five weeks, have just revealed their honeymoon destination. They chose Austria! Lauren loves the musical The Sound of Music and was thrilled to tour Salzburg. Josiah followed in the footsteps of the majority of his siblings with an international honeymoon. Jessa and Ben went to Paris, Rome, and Venice, while Jinger and Jeremy flew all the way to Australia. More recently, Joy and Austin traveled to Switzerland, and Joseph and Kendra spent time in Greece. Hear from Josiah and Lauren in the video below. The Duggars are thrilled a lot. Like, they always seem to be very thrilled about one thing or another. Isn’t that awesome ... to be thrilled with life! I'd be thrilled to be able to go to Austria. Oh wow! I love Austria! Saltzburg is beautiful. What an amazing life to be able to go for your honeymoon. I wonder if they went into any of the beautiful old Catholic cathedrals in the area? Very sweet that they ended up in Austria, one of the places that Lauren has always wanted to go. Josiah is really thinking about Lauren, just as he did when he proposed at the same spot where Lauren's parents were engaged. Or he’s being advised from someone very wise! While I'm happy Josiah followed Lauren's wishes in choosing a honeymoon destination, I'm still a bit put off by Josiah's very wooden delivery in this clip. Yet again he's saying all the right things but his demeanor is so aloof and distant. And this was NOT how he has acted in prior TV appearances so I can't blame it on camera shyness, either. I'm really not sure how much longer I can give the benefit of the doubt here. I really do hope Josiah sincerely DOES love Lauren and didn't just marry her because he felt socially obligated to. Or that even if he did, he will eventually learn to love her, not just like her as a good friend, which is so far all I have sensed from him, whereas Lauren is obviously gaga. 9:15, if you’d watch the show then you would see he does love her. A video IS scripted more so than when they’re having their lives filmed for the show. Anon 9:15. I don't put much stock in the videos the Duggars release. They all seem so staged and rehearsed I think their true feelings are not displayed. This is Anon at 915 again. I very much DO watch the show and I watched last weeks episode (I also saw the wedding on the web before that). I got the same impression from the wedding and courtship scenes. The only exception was the first kiss, which was passionate, I admit, but that could just have been his excitement about a first kiss with any woman. I know the videos are scripted and rehearsed to some extent (as is the show itself). But when I compare the way Josiah looks at Lauren to the way John David looks at Abbie, the difference is obvious. Again I really HOPE what I sense is not the case, and I'd love to be proven wrong. For the sake of everyone involved, including the children sure to come along fairly soon. It sounded like Lauren would have preferred Israel for the honeymoon destination. I wonder why they didn’t go there? 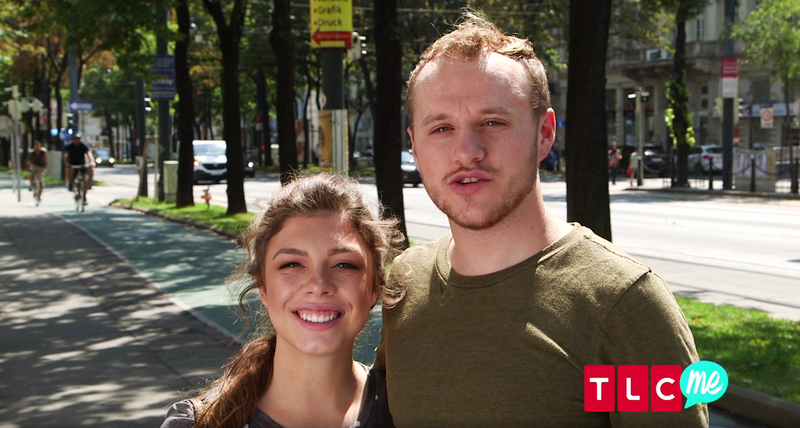 Maybe these couples don’t really get to pick the destination but TLC makes the decision. I'm from Sydney Australia and can see everything that is posted on this blog. I'm surprised to hear she has seen that movie. Why? Because Maria is Catholic? Or because there's some (pretty tame) kissing? I don't recall anything about that movie that's not family friendly, and I'm sure Lauren would find the size of the Von Trapp family something she could relate to. And while Maria is Catholic she does forsake being a nun for the sake of marriage and family instead. So while I guess it's possible the Duggars may not have approved of the movie, I can also see why the Swansons would have. While they also follow the IBLP curriculum, but so do the Bates and they also do many things different from the Duggars. Lots of premarital kissing, unchaperoned meetings in the gazebo, front hugs, and dancing! What’s wrong with the movie? I can’t think of any reason Christians shouldn’t see it. 2:32, there are literally only two premarital kisses in that movie, and Maria even talks to Liesel latest in the movie about waiting for the right one. And I’m pretty sure the Duggars don’t care if other people kiss, dance, or frontal hug, they just choose not to. Anon at 232AM: All of what you mention MAY be reasons for the Duggars themselves to have not watched that movie (though for all we know they did). But Lauren was NOT raised a Duggar, she was raised a Swanson. Maybe the Swansons believe young people should be chaperoned, but grown adults can be trusted. Maybe they don't think kissing before marriage is sinful. Despite the "cult" accusations, I don't get the impression all IBLP familes march in lock step on all social issues (the Bates have no problem with front hugs, for instance). I think the Duggars realized long ago that if they limited their marriage partner pool for their kids to those who agreed with them 100%, they'd be stuck with a lot of spinsters and bachelors, or have to resort to actual arranged marriage. While it seems the Forsyths have mostly similar values to the Duggars, Derick, Ben and Jeremy were all raised in different Christian traditions. Yet JB was fine with his daughters getting married to them and deferring to their authority. So I think the bar regarding daughters in law is even lower. As in a way what they believe doesn't really matter, as long as they agree to defer to what their husbands beliefs are. Nothing is wrong with the movie. It's fabulous. I'm surprised Lauren watched it. Why??? The reasons 2:32 listed above. Lauren wasn't a Duggar. She more "progressed" per se than they are. 6:07-- Defer to their husband's authority? Sheesh, sounds like the Middle Ages! Women do have brains and the ability to reason...sometimes better than men! I was born and raised in a Pentecostal family many many years ago. That was the first movie my father allowed me to attend. Catholics pray to the same God and Jesus that we do. They may worship differently but we worship the same God. Get over judging others. It's not wise to do so. Love that movie! The real lives of the Von Trapp family was very very different than the movie! Fraulien Maria was not how she was portrayed by Julie Andrews! But it's interesting to read about and visit their hometown! Was Josiah able to speak Austrian to the locals? Austrian isn't a language..most Austrians speak German. An austrian language doesn’t exist. It’s a german dialect. (They only speak it) in Switzerland for example, its more like a real language because they write it, too. Austrian doesnt truly exist ;) Austria has a bunch of german dialects, all quite different from each other. People still can understand one another. As long as he speaks english it should be fine. The official language of Austria is German. There is no Austrian language. The official language of Austria is German. People in Austria speak German not Austrian. Although there is a dialect and sometimes hard to understand, it is still German. There is no Austrian language, Austrians speak German with an Austrian dialect. It was probably all Greek to him. I hope they know their Austria from their Australia. Remember the woman who, years ago, got on a flight to Aukland (NZ) when she meant to get on the one to Oakland (CA)? Sounds like a tall tale or a massive failure by the airline. Plus, passports are required at the gate for international flights (but not domestic). Yet again I wonder how comments like this get past screening. Obviously the Duggars can tell Australia (where they actually DID travel to in January) apart from Austria. It's so sad how even "fans" think the Duggars are that ignorant. LOL. Bad as the boss who told his secretary to book a flight to Washington (meaning D.C.) and she booked a flight to Seattle. When asked why she did that, she replied "you didn't say which city in Washington so I just picked one." Yes, it happened. To a man, but it happened. In 1985. People do all kinds of silly things. We have a Sydney, Nova Scotia, Canada and people accidentally end up there who meant to go to Sydney, Australia! 9:17- the Duggars prove their ignorance time after time- remember the incident with the family in Londin- they couldn't pronounce bangers and thought toad in a hole was a frog being served! @9:17 Then they should do a talking heads segment on the show and ask the kids to put a pin on a map where Austria and Australia are. That would be right up the producers' alley. I'll bet with a blank world map, it would be difficult. I worked for 30+ years in reservations for a major airline and this stuff happens, though you won’t get on an international flight without passports etc. I never stopped being amazed at the ignorance of some people. Actually some people DO bring passports as ID for domestic flights because not everyone has a drivers license or other "official state ID card". I did that myself when I was a kid. So I can certainly imagine someone planning a domestic flight, accidentally getting on an international flight. I am so happy for these two. I recently had a chance to meet them and they were both so sweet to my 1 and 3 year old. They will make wonderful parents! I love the Sound Music that's my favorite movie. Can wait to watch their honeymoon on counting on. does TLC pay for these extravagant honeymoons? Perhaps they should chip in at all the weddings where they seem to usually serve snacks only and actually serve some real food. Food for over 1,000 people would be expensive and TLC probably agrees to pay for their honeymoons as long as they are able to film them. The newlywed couple doesn’t stay long at the reception after the wedding ceremony so there wouldn’t be as much to film as the honeymoon. I’m sure they pay for both. But it doesn’t help their filming to serve guests proper dinners, so that wouldn’t fall into the production budget. Considering the number of wedding guests, serving a meal would be a logistical nightmare. It would be extremely difficult to find a venue to accommodate so many people in the area in which they live. You can do buffet service for that many, with multiple lines. Those huge churches have the right size kitchens and assembly rooms. Who cares if they ONLY serve snacks? It is not their responsibility to feed people. The Sound of Music is one of my favorite movies! The acting was superb!I also like the old Disney movie about the white horses that was filmed in Austria. What was the title of that movie? Miracle of the White Stallions! I love both of these movies! Maybe you are thinking of The Miracle of the White Stallions? The Lipizzaner horses are from Austria. You are wrong. Lipizzaners originate from Slovenia. This is neighbouring country of Austria.Horses come from Stud farm Lipica (You can see even the name is connected). In the past this was one huge country: Austria - Hungarian monarchy and horses went to Vienna only to school. But they originate from my small country. As you can guess I am Slovenian and quite sensitive about our beautiful Lipizzaner horses. Perhaps Lauren and Josiah were able to speak Austrian to the locals. They make a handsome couple! German is the primary language spoken in Austria. It is German- no such language as Austrian!! Salzburg is the closest to Sound of Music film locations. It is beautiful and is where Mozart’s home is now a museum. Huh? You do know that Austrians speak German? Google and learn something. 12:04, you should have been homeschooled!! 12:04- I attended public schools and I knew that German is the primary language of Austria. Very happy for them. We can't watch the videos because we are in Europe. I was't able to watch the video for baby Felicity etc. Could you please do something about it for funs in Europe? Thanks. That’s controlled by TLC the blog won’t be able to fix it. Most are available on you tube. Si and Lauren are totally adorable and sweet. I think they are probably really enjoying Austria and that was where they wanted to go. I don't remember ever seeing Si doing anything tacky or dumb like Jim Bob. I'm sure they appreciated Austria as any normal people would. I am so happy for them. You don’t remember seeing Josiah ever doing anything tacky or dumb? Did you miss Joe’s wedding? 11:36 I agree that it was a bit tacky. Also, the way he carried Lauren out down the aisle was a bit awkward. But he more than made up for it when he planned the engagement at the very place Lauren's parents were engaged. Also, going to Austria was on Lauren's bucket list apparently. He really is showing he cares about her. How sweet those were. in some of the pictures from Austria. All in all, I think Josiah appears to have chosen well. I can see them complementing each other. I think 7:01 meant tacky and dumb on a trip that could have belittle the people of the place they were visiting. Nonetheless, I agree, Josiah did a tacky and dumb thing at Joe’s wedding. He seems to have matured, I pray! I agree wedding pranks are tacky and immature. However, Josiah has been one of the most engaged Duggars during foreign travels. He was actively listening to the tour guide when they visited Stonehenge and asked questions. It was nice to see that he was so interested in the history. He may be one who values the cultural aspect of travels. I’m the 7:27 poster. I want to add that I too was skeptical of this union. And judging by Joe’s wedding, I thought Josiah was goofy and rude to want the attention for himself in such a silly way. However, he seems to have taken his commitment to Lauren seriously, and will be a responsible husband. I remember Ben, too, was immature in the beginning, especially around the kids. He acts like a responsible adult now. Now, if Joe would just stop licking his plate . . .
Austria is on my bucket list! I'm Austrian and I live in Vienna. It would be nice to meet them while they are in Austria. I think it's too late for that. I hear they're back in the USA now. ..they work for tlc ofcourse. Nobody gives up their privacy for free. Yes. Lack of privacy is a drawback for the Duggars but they don't seem to mind. Always amazed that they all have enough money for overseas travel and 1000 guests at their weddings. It’s nice for once to hear of a male Duggar choosing a destination his new wife wanted to see. That may or may not mean Josiah's beliefs are any more "liberal" than Jim Bob's regarding the roles of men and women, though. I certainly didn't get that impression from their wedding vows. BTW I know a couple who have a very traditional or "complementarian" marriage where the husband is head of the household, but who went on a second honeymoon to Prince Edward Island because the wife is a big fan of the Anne of Green Gables books. But the husband has never read the books himself (though he's seen at least one of the many movie/TV adaptations). A "complementarian" marriage doesn't mean the husband treats the wife like a slave and do nothing to please her. Sadly some husbands DO act that way, but I certainly don't think such men are loving their wives like Jesus loves the Church. Austria is so incredibly beautiful. I’m hoping Josiah and Lauren are more mature than Kendra/Joe and Austin/Joy-Anna. They appear to be a tad more culturally minded. Do all of U want to know something great, I met CHRISTOPHER PLUMMER!!!!! I used to live in Stratford ON, they have a Theatre Festival, and I worked for The Stratford Theatre Festival. They put on the Sound of Music, he used to come on watch, and I was working that day. He is super great, and he is like the Georg Von Trapp. He, and I talked a good hour or so!!!!!!!!!!!!! Mr. Plummer is a Canadian icon. So great that you meet him!! By the way, the Statford Festival is world renowned, attracting well known serious actors. WOW - the Duggar honeymoons (except Jill & Derick & Josh & Anna) are unbelievable. We were happy with a week in the Poconos in Pennsylvania - back in 1963 (one of the best weeks of my life). I wish the newlyweds much happiness. I'd be tempted to wear an old-fashioned Austrian dress and twirl around in the mountains like Julie Andrews did in the beginning of the movie! I thought the Duggars didn't dress up like Halloween. There is a big difference between dressing up in period or cultural clothing (like Derick, Jill and JimBob did in Kathmandu) and dressing in a costume for Halloween. Didn’t they also dress up in costume for some promotion at Chick-filet? And Derick dressed up as a mascot. They wear costumes. Just not for Halloween which really is different. Oh my goodness, Lauren is SO SWEET!!! You're implying OTHER Duggar in-laws don't know that. In fact, I'm pretty sure you're referring to a SPECIFIC one who doesn't appear on the show anymore. Hmm. BTW you can be kind and loving to someone without automatically accepting everything they believe and do. Did they just go on a honeymoon or it's the news from a month ago? Maybe they stayed in Arkansas at first, just to settle. Why Lauren's middle name is Milagro?? What does it even mean?? 9:45 I can't say about the reason for the name. It means miracle in Spanish. It means miracle. I think is it also her mother's middle name. Her parents liked the name and wanted to honor her mother by giving it to her. Milagro is Spanish for miracle! Milagro is spanish for "miracle" I don't know the story as to why her parents gave her that name. That would be interesting to find out. Milagros means Miracle in Spanish. I can't answer why it is her middle name, but in Spanish "Milagros" means miracles. Milagro means miracle in Spanish! Perhaps it is a surname in her family tree. Mom's maiden name or grandmother's maiden name? I thought Milagros are small charms that are Mexican in origin. The word does mean miracle - appropriate for how her parents felt at her birth. Hmm, if it's a miracle in Spanish, why would they refer to a a work in Spanish? Is her mother Hispanic? Would be interesting to find out. Well now we know Lauren is "El Salvadorean" and this does likely come from her mother's side as "Swanson" is NOT a surname common in that country. I wonder if this means the Swansons are also involved in the S.O.S. ministry as they do host missions to El Salvador. Also makes me wonder, if the Seewalds will eventually wind up to adopting one of Lauren's relatives from that country. Family connections certainly make it easier to adopt domestically, I assume this would be true for international ones as well. Josiah looks slightly tired and not very happy. I think he looks slightly tired but happy. Me and my husband went to Salzburg on our honeymoon as well! Only for two nights, though and then headed to Vienna. We‘re from Germany though. Wondering, what they are actually doing, Itis a rather small town. Dear Josiah and Lauren, I can't to watch the honeymoon on TV. Austria is a beautiful place. I hope you have a great time in Austria. Natasha B.
Dear Josiah and Lauren, Very happy for you to get to go to Austria, it's a beautiful place. I know you will enjoy your trip. I can't wait to watch it on TV. Natasha B.
Awww, they are cute together in this honeymoon video, and seem so joyful and appreciative for the opportunity to be in such an amazing place! How wonderful. I am enjoying getting to know Lauren and what she values and enjoys. She is an interesting and mature young lady. I think it's been fun to get to know the new spouses these last few years. Each one is a unique personality. I can't wait to get to know Abbie - she is so pretty and appears to be fun and very special. Looking forward to all the new episodes. And congratulations, Josiah and Lauren! Lauren did well on marrying Josiah. Winter travel to Australia, more travels with family in SFO later on, now going to europe for a honeymoon... I wonder where they will live, obviously Josiah will provide Lauren with a nice house too. This sounds like a marriage opinion straight out of Pride and Prejudice. No, just a way to insinuate that Lauren must have married Josiah for the Duggar money and lifestyle, not because she actually felt anything for him personally. I don't get that impression from her at all, though. Doubt she's that good an actress.